The town of San Ramón is a perfect little grid, its church spires towering above the surrounding buildings. It has many of the amenities you’d expect from a proper city, including a cultural center and a few small museums and galleries. There are events a-plenty, including concerts, exhibits, plays, and festivals. Nearly 11,000 people live in town, with a total of over 86,000 in the greater San Ramón region, or cantón. I like that it’s something of a college town, as there’s a University of Costa Rica campus here. All those eager young minds help enliven the place. San Ramón is an active little college town. There are Pacific beaches 45 to 60 minutes from here by car. Weekends at Caribbean beaches are viable, too—there are more than a few to choose from if you’re willing to drive three to five hours. The nation’s capital, San José, is about an hour’s drive southeast. The international airport is even closer…you’ll hit Juan Santamaría Airport about 15 minutes before the San José city center. There’s plenty to do right in San Ramón, though. Nancy Sperry, 68, and husband Andy Robinson, 69, are the epitome of the San Ramón expat—active, engaged, and never bored. They were on a tour when they heard about the Community Action Alliance, a local organization helping to foster business and community service initiatives. Andy says, “That answered the question we didn’t know we had: What the heck are we gonna do when we retire?” The CAA got them off to a running start, and they even set up their own fundraising initiative, called Friends of Hacienda Vivace. Their days are filled with charity fundraisers, cooking and painting classes, derbies, expat gatherings, concert series…and the list goes on. 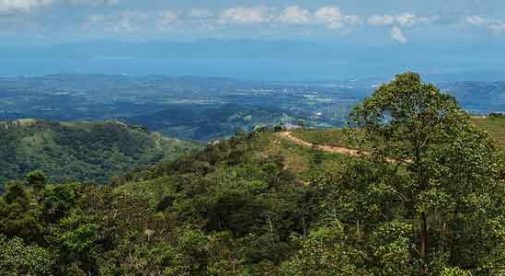 San Ramón is one of Costa Rica’s coolest expat destinations—for most of the expats that live here, this fact is the clincher. With altitudes of 3,400 to 4,000 feet, it’s lush and breezy. 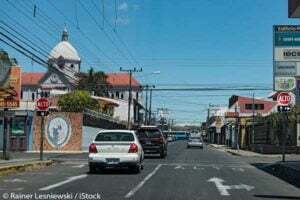 Daytime temperatures are usually around 75 F, with evenings in the 60s F.
And though it’s a hub for surrounding communities, San Ramón remains relatively inexpensive. A couple can live here for $2,000 a month, including rent and requisite payments for membership in the Caja, the national healthcare system. Caja payments for most expat couples run $60 to $100 a month, total. Private healthcare is inexpensive, too. A knee replacement surgery that would cost $35,000 to $50,000 in the U.S. is about $7,000 at Hospital Metropolitano, a small private facility with competitive prices. As for housing, furnished places rent for just $550 to $1,000 a month here. The town is just over six square miles, about as long as it is wide. But expats live all over the greater San Ramón area, anywhere from two to four miles from the main park. So is San Ramón right for you? The mastermind behind La Torre park and gated community, John Buford, sums it up best. He has been living in San Ramón with wife Caryl for seven years. They’re passionate about social outreach and music, and in San Ramón, they found numerous outlets for their creative energy. They spearheaded TubaChristmas, an annual event that brought brass-infused Christmas carols to town starting in 2011. And they got involved in local theater, participating in reader events and comedic dinner theater. “High on our wish list was an organized expat presence that was integrated with the Costa Rican community. We wanted a social setting where we could immediately plug in and begin our ‘pure life’ adventure,” says John, referencing the Costa Rican catchall phrase pura vida. It’s a phrase that’s used in many ways… as a greeting, for example, or as a response to a “how are you?” Most of all, it represents a culture and a way of life. One that involves less complaining and consumerism… and more community service and sunsets over cool green valleys. Pure life.